Nike by Melrose features a number of digitally-led, premium service offerings, designed to match the needs of neighborhood consumers. When walking in the store, shoppers can make a first stop for service at the Nike Sneaker Bar. Powered by the insights and engagement of thousands of NikePlus members across five zip codes in LA, the store is a uniquely curated home for NikePlus Members and the style, sport and speed-obsessed consumers of the city. The Nike Live concept was created in support of Nike’s efforts to unite digital and physical shopping experiences for its consumers, and to further personalize the NikePlus Member in-store journey. 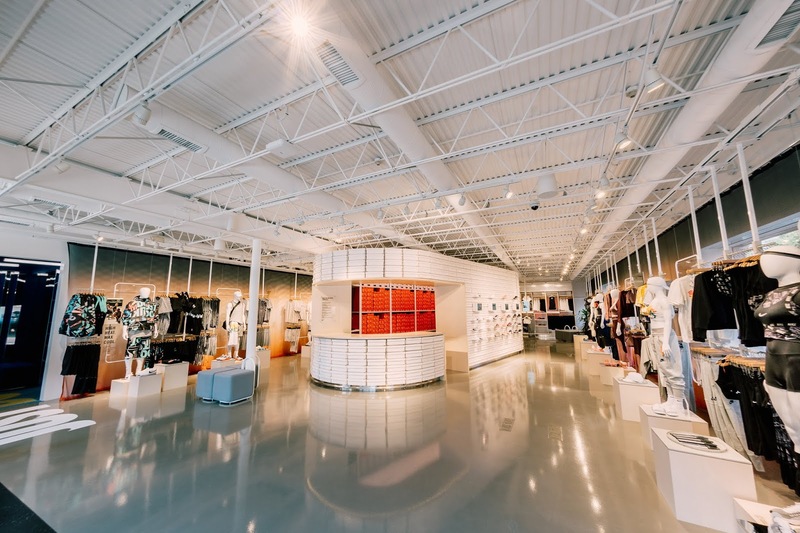 The location and the product assortment of Nike by Melrose was selected using insights gained from NikePlus member activity and buying patterns across Nike’s suite of digital touchpoints (Nike.com, the Nike App, the NTC, NRC, and SNKRS apps). Nike by Melrose features a number of digitally-led, premium service offerings, designed to match the needs of neighborhood consumers. When walking in the store, shoppers can make a first stop for service at the Nike Sneaker Bar. There they can talk with a Nike Expert about the lifestyle and performance footwear available, request to try-on an item on the spot, purchase and go. This is the fastest shoe buying experience Nike offers. As a NikePlus Member, shoppers also have access to the NikePlus Unlock Box where they can scan their Member pass every two weeks for unique Nike products and goods. They can also use Swoosh Text, an SMS messaging system that seamlessly connects them to the Nike by Melrose store team through the Nike App. 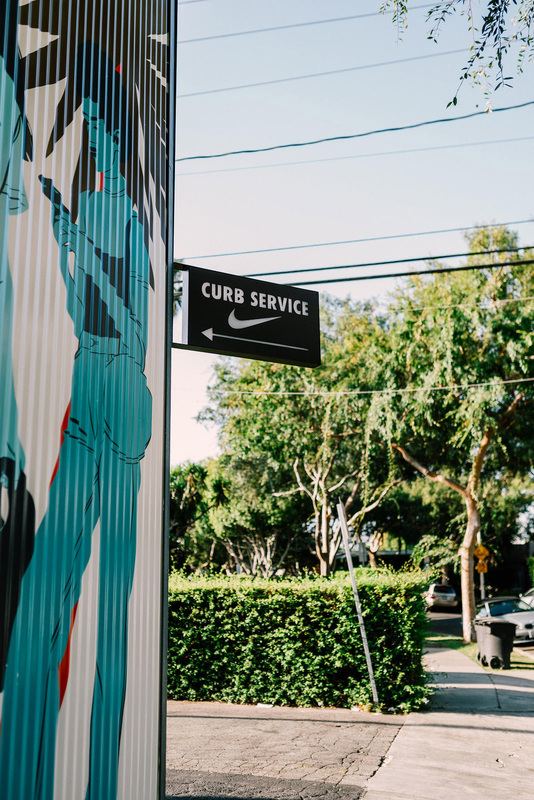 Curb Services give NikePlus Members the ability to contact the store ahead of time using Swoosh Text and return or exchange goods curtsied. 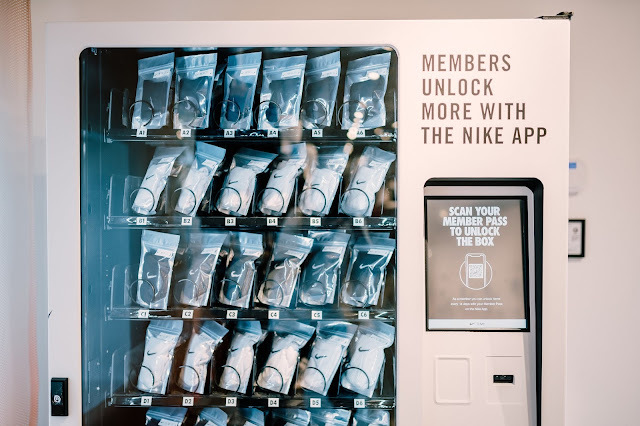 The Nike by Melrose store also uses Nike’s New Nike App at Retail service, allowing NikePlus Members to reserve product to in-store Digital Lockers, scan product barcodes to learn more (i.e. product availability in nearby stores or online, and available colorways) and access new features and content in their Nike App homepage. 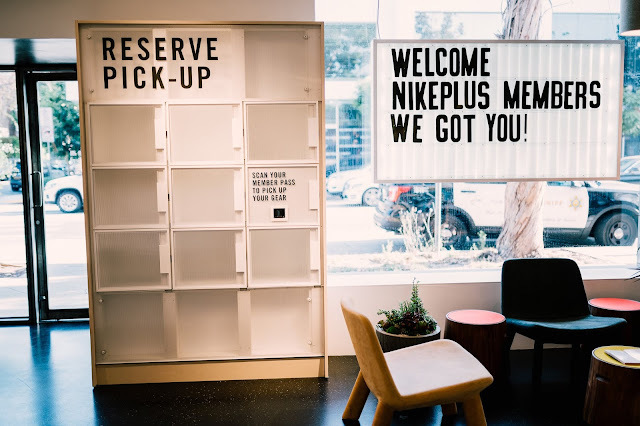 Nike Express Sessions at Nike by Melrose offer bookable appointments for NikePlus Members through the Nike App. The sessions are designed to provide one-to-one personal service to consumers within thirty minutes and will largely be hosted in the Dynamic Fit Zone. This area is outfitted with a lounge, fitting room, space for alterations on pants and tights, bra fittings, and Nike Trial Zone for trying out shoes on the in-store treadmill. Nike by Melrose will also serve up an even product assortment for men and women informed by local and Nike.com favorites. From everyday items that local NikePlus Members love like the Men’s Tech Fleece Jogger or the Women’s Classic Swoosh Sports Bra will be available alongside a bi-weekly delivery of fresh new arrivals – a first for Nike. The assortment will also include a select level of city-exclusive merchandise as well as curated seasonal picks from Nike collections. 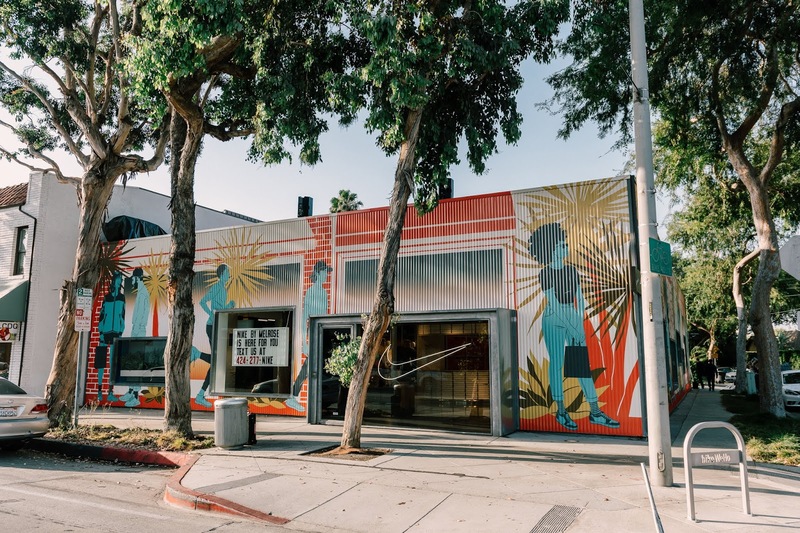 The Nike by Melrose exterior mural also has ties to Los Angeles as it was designed by artist and illustrator Bijou Karman, an LA native whose work reflects the unique mix of nostalgia and flora that comes along with the California landscape. With inspiration from the diversity of Angelinos and the style of the neighborhood, the Nike by Melrose store mural is a reimagined walk through a typical day in LA. The mural, titled “Sunsets on Melrose,” showcases these characters shopping, taking part in sport, and experiencing local offerings in one incredible scene – all against the backdrop of a classic LA sunset. The primary destination in the store, the Nike Sneaker Bar offers a unique and fast shoe buying experience, with a mix of style-minded and performance footwear available. Once arriving at the centrally located Nike Sneaker Bar, consumers are greeted by a store athlete with elevated footwear training. The consumer can get any footwear questions answered on-the-spot, request their favorite shoe(s) and then after quickly receiving the pair, can try on and checkout. Nike App at Retail is the Member’s ultimate shopping companion, bringing digitally led experiences to physical retail all through the Nike App. Several of the features of Nike App at Retail will be available at Nike Live. Reserve - Using the Nike App, Members can reserve product to be held for them at the store. Consumers can shop the product they want in the Nike App and then complete their purchase with an in-store athlete. Retail Home - When entering Nike Live, Members will gain access to an array of new features and content via their Nike App homepage. Nike Scan - Members can scan any product barcode from the app to pull up online and store inventory, and to learn more about the product. NikePlus Unlocks - NikePlus Member Unlocks are delivered through the Nike App to reward the best of Nike product, to deliver immersive brand experiences, to award activity achievements (i.e. through NRC or NTC) and to share partner rewards with our Members. Member Unlocks can be given directly from a store athlete at Nike Live when serving a shopper. Select Member Unlocks may also be delivered to consumers outside of Nike by Melrose, which they can redeem in-store with an athlete. An elevated one-to-one service journey for NikePlus Members, bookable through the Nike app and designed to meet the needs of the athlete in sport, fitness and style. Store athletes guiding these sessions will have a distinct knowledge of Nike products, gear, styling, NikePlus Member benefits and Nike’s suite of apps to personally serve consumers. If a product isn’t available in-store, they will be able to pull product from other stores in the marketplace. Nike Express Sessions at Nike Live are designed for speed and efficiency, delivering one-to-one service to consumers in thirty minutes or less. Members are welcome to book beyond thirty minutes if they wish to extend their service experience. 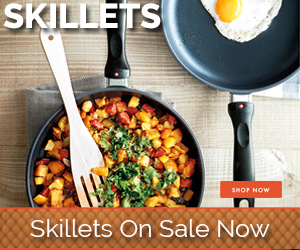 An opportunity for consumers to purchase, return and/or exchange via curbside pick-up. If a consumer wants to exchange an item, they can use Swoosh Text to message the store and make sure they have their size. The member texts the athlete when they’re close and the athlete comes out of the store to return/exchange the product or complete a purchase transaction. Consumers can enjoy a two-way conversation through SMS messaging with a store athlete; enabling faster, better and more personalized service. A unique in-store Membership benefit where every two weeks a Member can redeem Unlocks using their Member pass at an innovative, digital vending machine to get a hold of unique product/offerings. 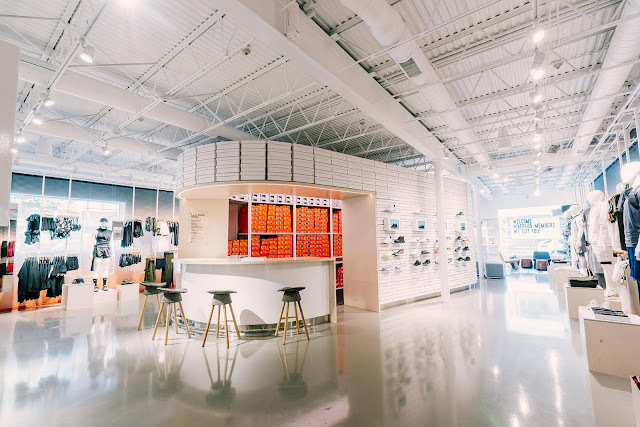 To allow Experts to further connect with consumers, sessions at Nike Live can take place in the Dynamic Fit Zone outfitted with a lounge, rooms for styling and a Nike Trial Zone (with treadmill) to try out product in-store. Additional services like bra fitting and alterations for Nike tights and pants will also be available in this space. Nike Live will be equipped with smart lockers members can open with their NikePlus member pass. These lockers will serve as a place where members can easily pick up products they’ve reserved via the Nike App or through Swoosh text. NIKE, Inc., based near Beaverton, Ore., is the world’s leading designer, marketer and distributor of authentic athletic footwear, apparel, equipment and accessories for a wide variety of sports and fitness activities. Wholly owned NIKE, Inc. subsidiaries include Converse, Inc., which designs, markets and distributes athletic lifestyle footwear, apparel and accessories; and Hurley International LLC, which designs, markets and distributes surf and youth lifestyle footwear, apparel accessories. Inspired by the artists and radicals who brought to life San Francisco’s North Beach and Jackson Square neighborhoods in the 1950s, CANOPY was designed to be a profound departure from the standard workspace. Strong site-lines organize the 13,000-square foot space, with CANOPY’s signature glass-enclosed private offices lining one side, and a café by Jane and open workspaces on the other. 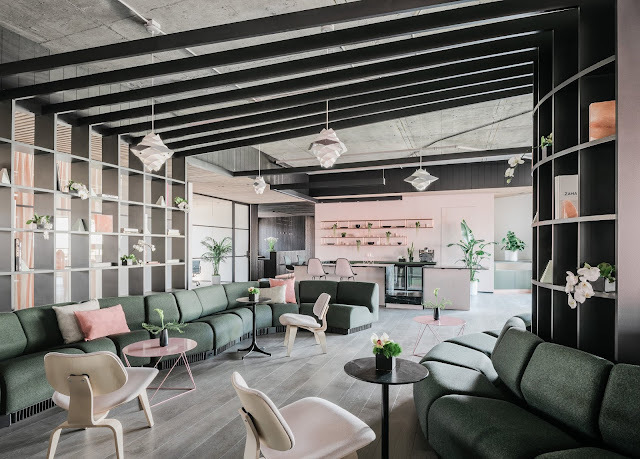 In the center, an organic lounge is a place-making architectural tour-de-force intended to encourage both casual conversations and work meetings. 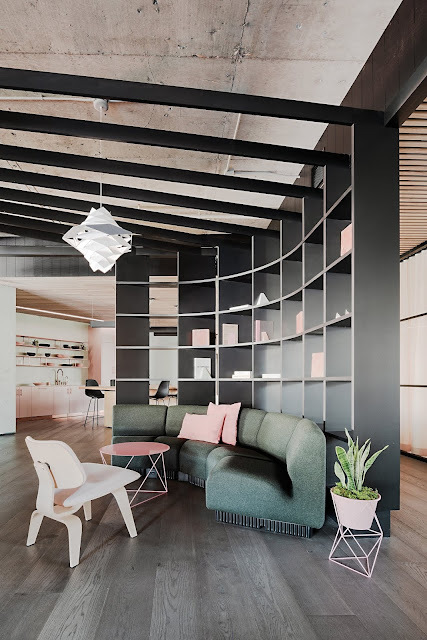 A literal, dramatic architectural canopy was built around three columns as a freestanding fanning structure that doubles as book and magazine shelving. 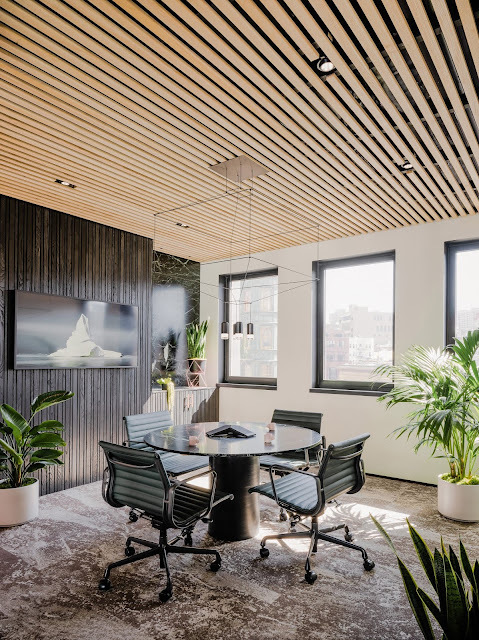 The tree-like design serves as both a visual privacy screen to the conference room and work areas, as well as a containment of the lounge area. An exercise in visual expression, CANOPY Jackson Square strives to create a harmonious and thoughtful balance between work and social. The space is bathed by natural light; all areas were designed to have light filtering in from multiple directions. 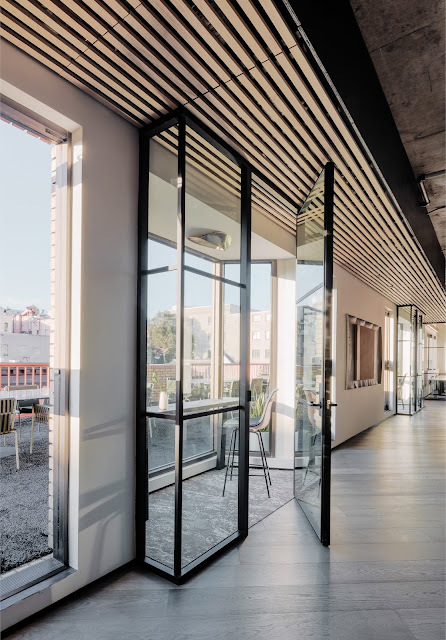 CANOPY was built with innovative features that encourage privacy and inhibit sound. 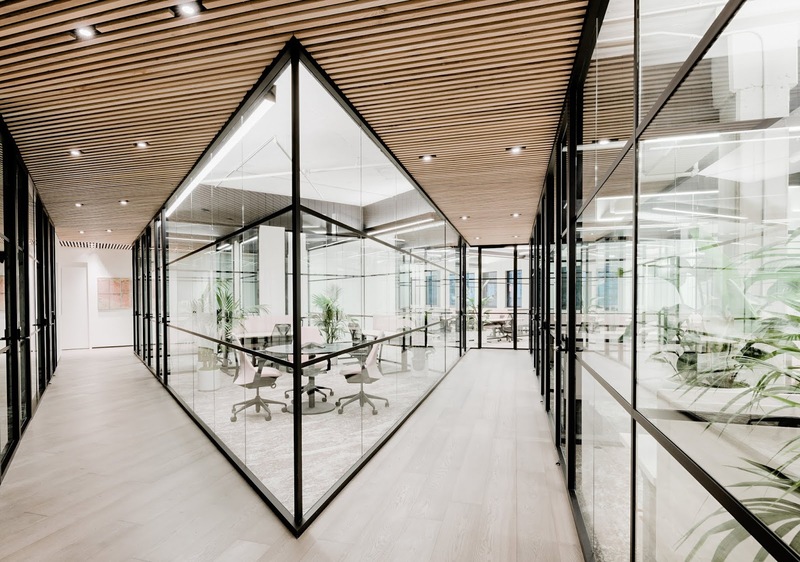 Private offices are sealed by high-tech Modernus glass partitions and feature soft floors and ceiling surfaces, inciting quality conversations. 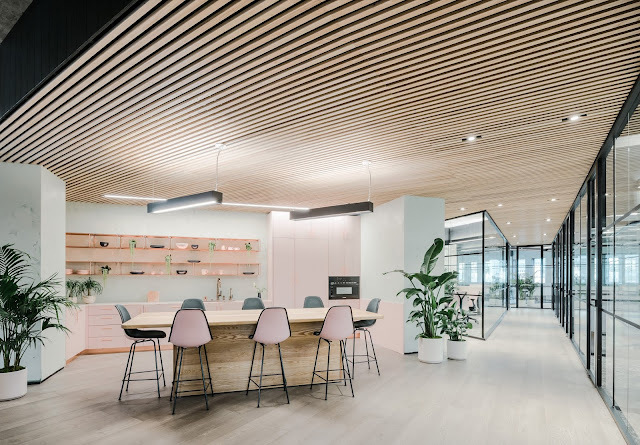 Common spaces have slated ceiling insulation throughout, as well as CANOPY’s signature foam light fixtures, which provide additional sound control. 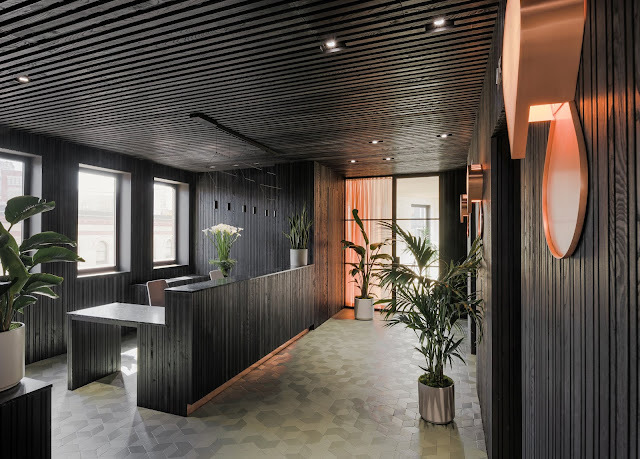 Upholstered furniture, fabric desk privacy screens, and soundproofing materials that line the phone booths and Mother’s Room all uniquely contribute to a distraction-free environment. 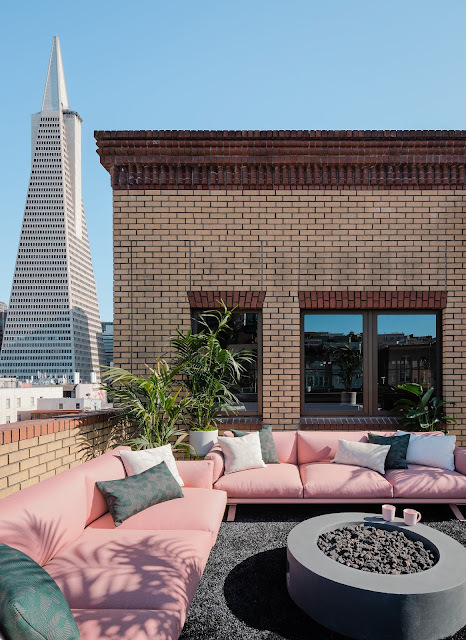 A rare and standout feature of CANOPY Jackson Square is an innovative outdoor work terrace encompassing 1,500 square feet with breathtaking views of San Francisco and presenting a healthy and new work style enabled by technology and design. The expansive space is partially covered and heated for year-round, all-season use. 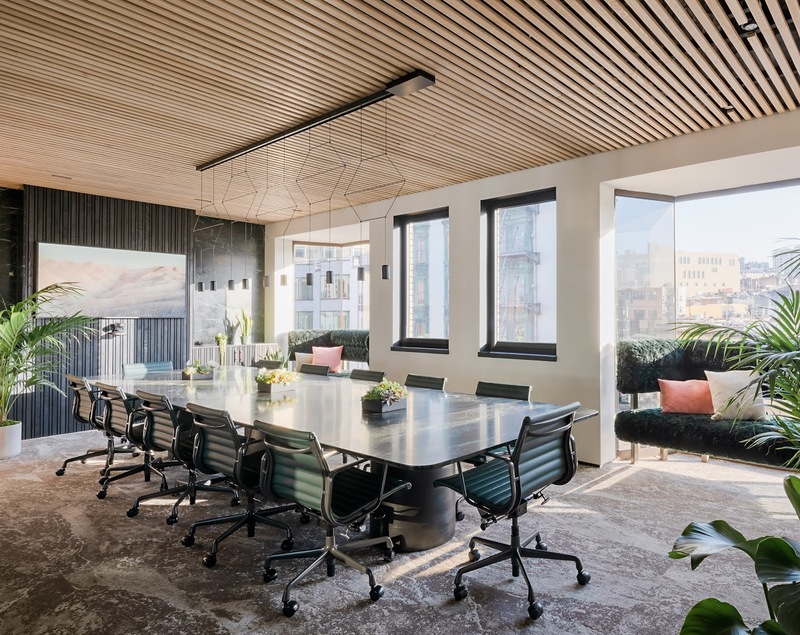 Three zones encompass café-style seating, a casual lounge space, and workspaces for one-on-one collaboration or meetings complete with marble tables and high-quality, ergonomic, heated seating by Galanter & Jones that enable longer and more comfortable outdoor work sessions. 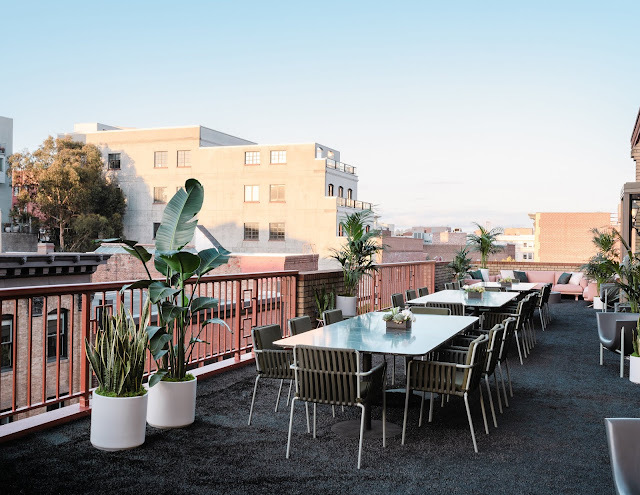 An outdoor awning structure, made of recycled sails and designed to protect members from the elements, was designed by Yves and Amir in collaboration with SF-based MAFIA Bags founder, Marcos Mafia. 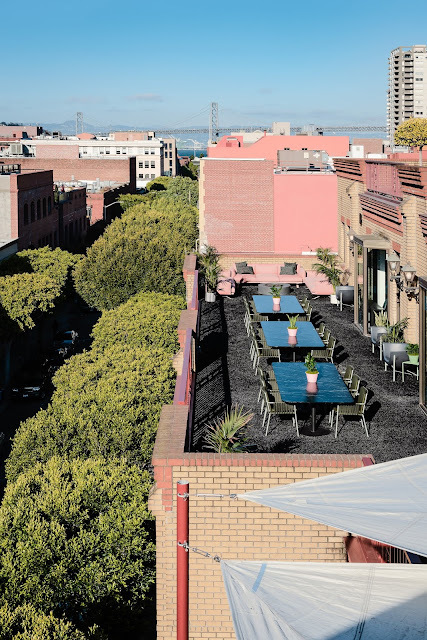 CANOPY Jackson Square’s color palette is a nod to its location amid the captivating neighborhoods of North Beach, Jackson Square, the Financial District and Chinatown. A sense of serenity and feminine qualities contrast and harmonize with the architectural textured black surfaces and exposed concrete, complimenting the brutalist masterpiece of San Francisco’s Transamerica Pyramid, which is visible from CANOPY. Similarly, green tones echo the oxidized copper accents of the vernacular Coppola Sentinel building, while unsaturated pink touches pay tribute to the historic stucco facade of City Lights, the legendary beatnik and activist bookstore down the street. 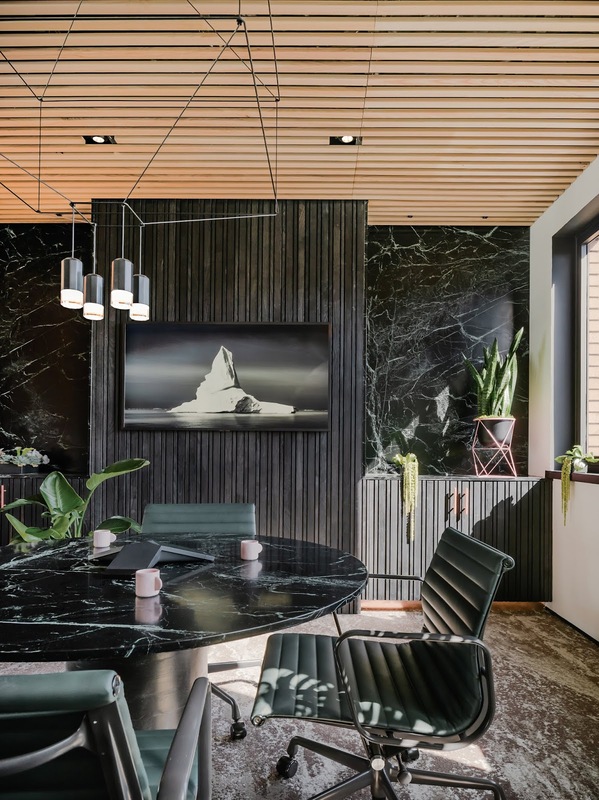 Verdi Alpi marble-infused tables and elements help bring the natural world into the space. 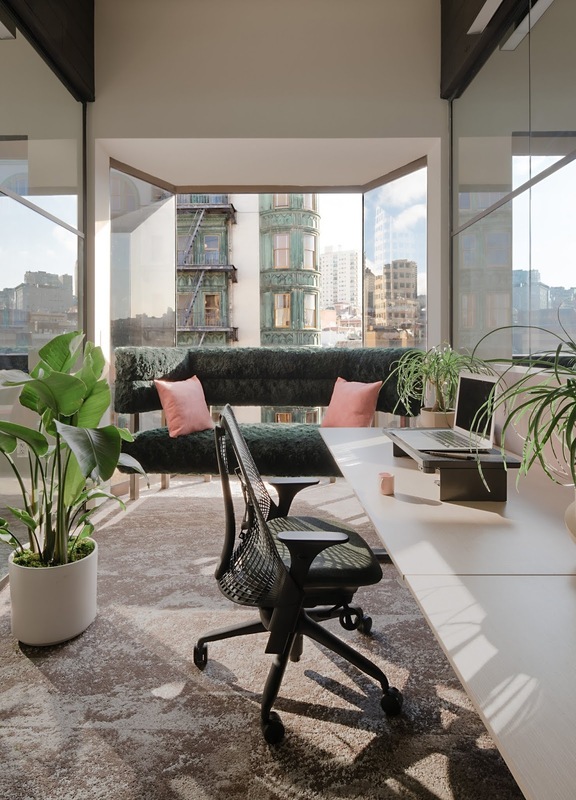 Contemporary office furnishings comprise a host of Herman Miller pieces, including Yves Behar-designed Sayl Chairs and Public Office Landscape System Tables, Charles and Ray Eames Chairs, Chadwick Modular Seating and Renew Sit-to-Stand Tables by Brian Alexander. CANOPY will also incorporate the LiveOS system by Herman Miller which automatically raises and lowers desks to the perfect height when it senses that a specific user is in front of it. These pieces are complemented by Eric Trine coffee tables and planters, Rodolfi Rodroni for Kettal outdoor furniture, Raw Edges for Mutina tiles, Concrete Cat mirrors, vintage 60s and 70s Preben Dahl lights, floating copper shelves designed by Yves and Amir, and M-PROJECTS-custom designed conference tables made of blackened ash and Verde Alpi green and black marble, as well as solid ash communal tables. 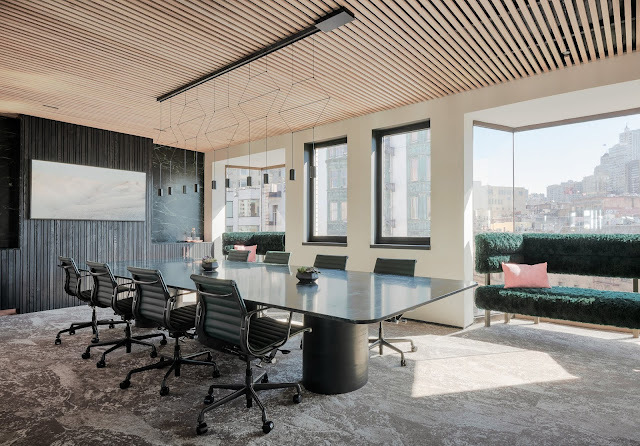 With both geometric and organic elements woven throughout, unique accents include pink quartzite kitchen finishes, blackened plywood bulkheads and Shaw Floors tiled organic carpet patterns. Bay Area craftspeople and artisans are amply showcased throughout CANOPY Jackson Square. 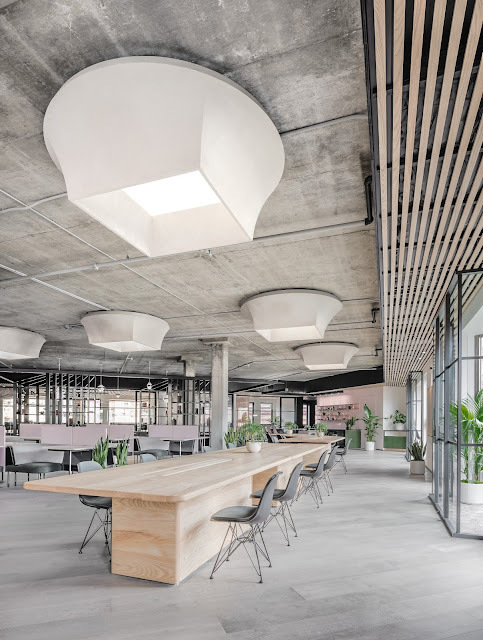 This includes ceramics from Year & Day and a plaster gradient wall by artist Victor Reyes within the break room and café, plus custom-designed tables, cabinets and light fixtures. 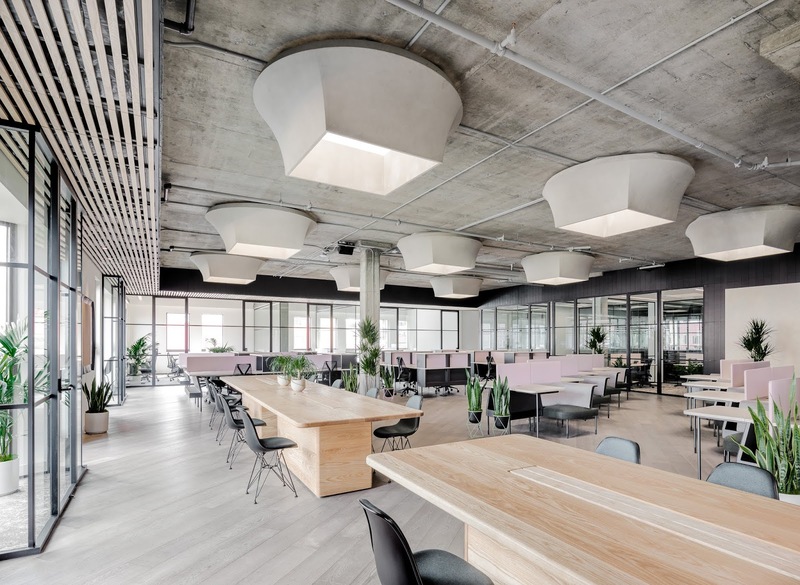 CANOPY is exceptional shared workspace for accomplished professionals and aspirational entrepreneurs alike. 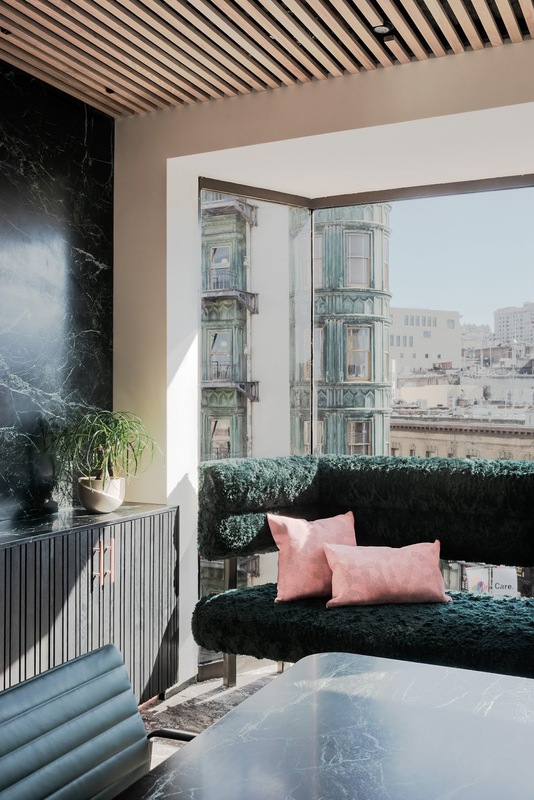 Custom designed by friends Yves Behar and Amir Mortazavi, and built from the ground up by M-PROJECTS, CANOPY delivers an elevated contemporary design, a distraction-free environment, and sophisticated membership and concierge-style amenities programs in iconic neighborhoods. 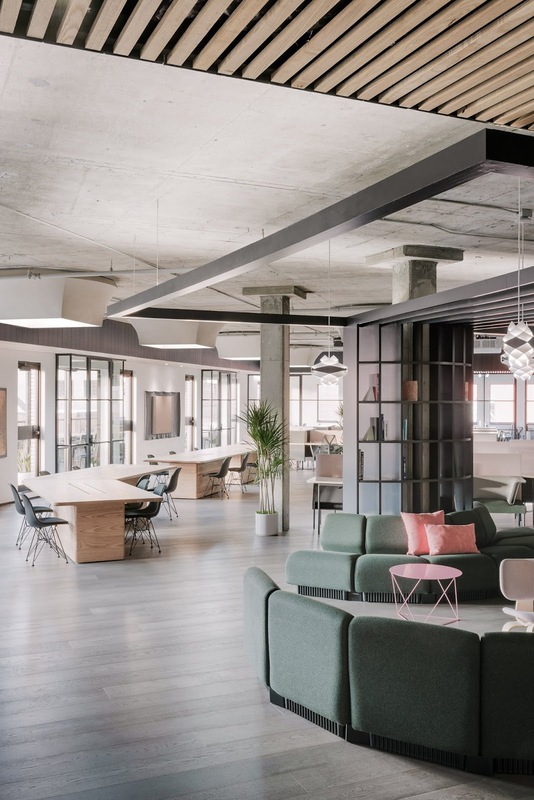 CANOPY centers on the premise that where you work affects what you do and who you are. 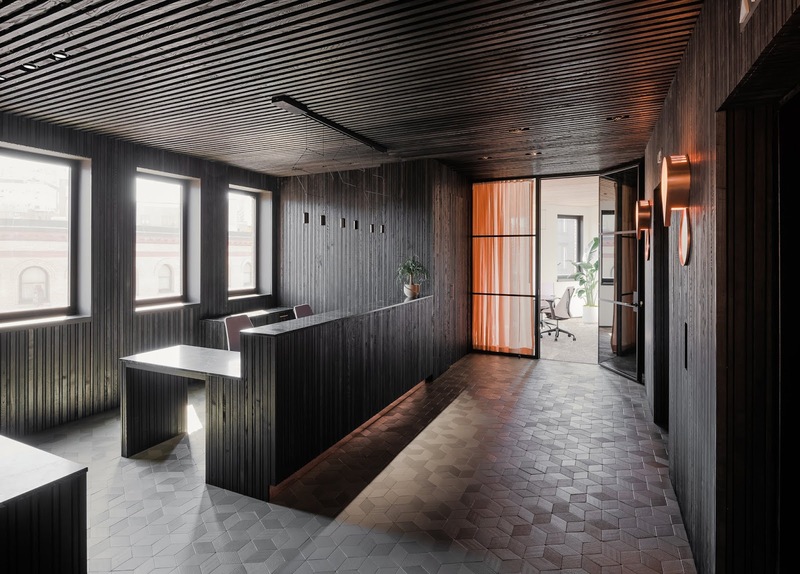 The members-only workspace seeks to bring people together and inspire great ideas that design can amplify. CANOPY’s first location opened in San Francisco’s Pacific Heights in 2016. Its second location opened in San Francisco’s Jackson Square in Spring 2018. Headquartered in San Francisco, CANOPY was founded by Yves Behar, Amir Mortazavi and Steve Mohebi.